Directions: Read carefully. Grab your calculator. 1. Participants are being eliminated every 10 minutes from a gaming competition. 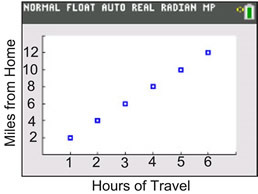 The data is shown in the chart at the right, with a calculator scatter plot below the chart. 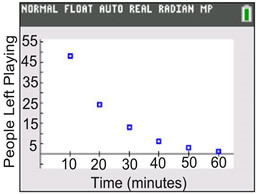 a) Examine the scatter plot. Which type of regression model will be the best fit for this data? b) Which choice is the regression equation? 2. Kevin is biking to visit his friend who lives in a nearby town. The data is shown in the chart at the right, with a calculator scatter plot below the chart. 3. Two data sets are being compared. 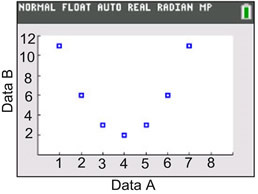 The data is shown in the chart at the right, with a calculator scatter plot below the chart.